Ever since the Ford EcoSport was launched in India back in 2013, it has been the most popular compact SUV in the country thanks to its affordable prices ranging between Rs. 6.75 lakh to Rs. 10.20 lakh (ex-showroom Delhi). This is also down to the fact that the EcoSport measures in less than four meters in length. Something that has remained largely unrivalled until recently when Mahindra launched its all-new TUV300 compact SUV that also measures in under four meters in length, allowing it to avail tax benefits applicable for compact cars in India. Prices for the Mahindra TUV300 range between Rs. 6.98 lakh to Rs. 9.20 lakh (ex-showroom Delhi). Let’s take a look than how these two compact SUVs fare against each other in their popular segment. The Mahindra TUV300 has a more boxy profile than the Ford EcoSport thanks to its more upright stance. But this works both ways for it as some buyers in the segment prefer its butch, old school SUV looks. Meanwhile the EcoSport definitely looks more contemporary. The cabin of the Mahindra TUV300 is quite spacious for that of a compact SUV. There is plenty of front and rear leg room and the tall height of the TUV lends an airy ambiance to the cabin. While the EcoSport does not have third row seats, the TUV’s units are not very comfortable and are best suited for short trips, very short trips. But at the same time, they do aid practicality when you need to seat two more people. Both SUVs come well equipped with driver information displays, double-DIN stereos with Bluetooth connectivity, steering mounted audio controls, front and rear power sockets, height adjustable driver’s seat and more. The Mahindra gets a Blue Sense mobile app while the Ford gets the company’s SYNC app link system. The Mahindra TUV is available with a single diesel engine option with the choice of a five-speed manual gearbox or an automated manual transmission. The Ford EcoSport diesel is also powered by a 1.5 litre turbo diesel engine like the TUV300. The EcoSport diesel on the other hand is offered with the only a five-speed manual gearbox. The Mahindra TUV300 is underpinned by the company’s third generation ladder frame chassis that is also the base for the current Mahindra Scorpio. The EcoSport in the other hand has a monocoque chassis from the global Ford B-car platform. Mahindra is offering anti-lock braking system with electronic brake force distribution as an option right from the base variant of the TUV300. 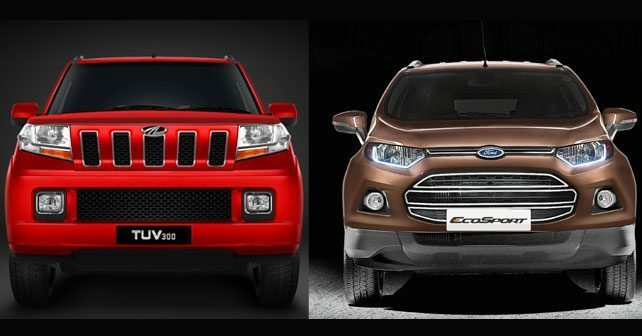 While the EcoSport gets ABS with EBD from the second from base Trend variant. The TUV gets dual front airbags as an option right from the base variant while the EcoSport offers the same from the mid-level Trend+ variant, while the top-end variants get six-airbags. Here is a look at all the safety features offered in both compact SUVs. Ford sells around 3,500 units of the EcoSport in India on a monthly basis. Based on this, the Mahindra TUV300 would appear to have good market potential. It is priced attractively, has the USP of being available in diesel automatic avatar, is quite refined, well equipped and ticks all the right boxes for a spacious compact SUV with the capacity of seating seven people (albeit suitable for very short journeys). Stay tuned to autoX to keep track of how the Mahindra TUV300 fares in the long run.